In a large bowl, beat the butter with sugar, seeds from vanilla, pinch of salt and cinnamon until fluffy, then stir in the egg. Add the flour and knead with your hands to a smooth dough. Cover with plastic wrap and transfer to fridge for approx. 60 min. Preheat oven to 200°C/400°F. Dust a work surface with flour and roll out the dough until approx. 5-mm/0.33-in. thick. Cut out the cookies with cookie cutters, transfer to a lined baking sheet, and bake for approx. 10 min., until the edges are golden brown. Leave to cool. In the meantime, mix confectioner’s sugar, water and lemon juice into a thick icing. The icing should flow very slowly from the spoon. If icing is too thick, add water a little at a time until desired consistency is reached. Divide the icing into 3 separate bowls and dye each one with a different color. Fill into piping bags. 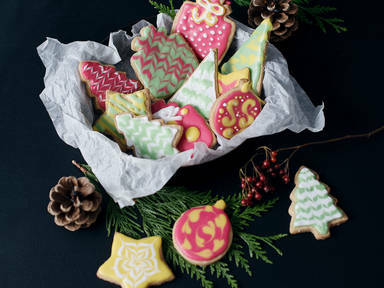 Decorate the cookies with the colorful icing. For a pattern on the icing, apply dots or lines on top of the base layer of icing. Before the icing dries, use a toothpick to pull the top color through the bottom layer in a pattern you like. Allow to dry over night before packaging. Enjoy!